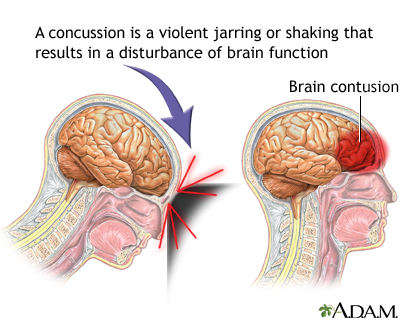 This animations shows the head receiving two impacts. One on the front, and one on the side from a boxing glove. Jesse Borke, MD, FACEP, FAAEM, Attending Physician at FDR Medical Services/Millard Fillmore Suburban Hospital, Buffalo, NY. Also reviewed by David Zieve, MD, MHA, Medical Director, Brenda Conaway, Editorial Director, and the A.D.A.M. Editorial team.